Visit Us in the Historic Grove Arcade in Downtown Asheville NC. The MOUNTAIN MADE art gallery is nestled in the heart of Western North Carolina. Located in the beautiful Grove Arcade (One of Asheville’s Architectural Jewels) in downtown Asheville. Mountain Made should be on your list of “must see” destinations whenever you are in the area, especially if you are captivated by the beauty and spirit of American-made arts & crafts. 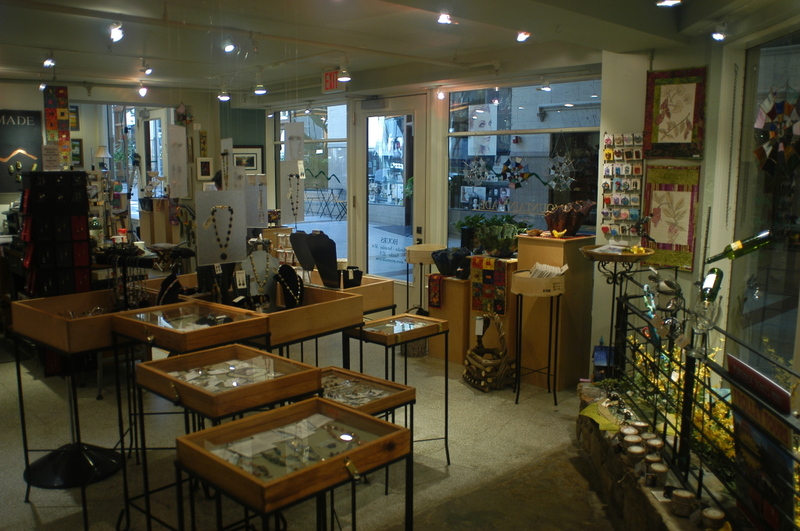 Our gallery displays a quality selection of locally handcrafted such as Jewelry & beadwork, Pottery & ceramics, Baskets & fiber arts, Quilted wall hangings, Carved & turned wooden art, Sculptures & figurines, Original paintings & photography prints, Metal yard art, blown and stained glass, Contemporary & Appalachian music CDs, and books by local authors. Once you step inside our art gallery, you can be certain that whatever you see on display will be some of the best and most unusual arts and crafts available anywhere here in Asheville or Western North Carolina. If you love American-made art then we invite you to explore our gallery of locally made arts and crafts. And don’t forget to browse our fine collection of handcrafted gifts. At Mountain Made we display only locally made arts and crafts from Asheville area artists. At Mountain Made, we display artwork from some of the best artisans, crafts people, writers and musicians from the Western North Carolina region. We are proud to support the entrepreneurial and individual development of the artists found here in our Southern Appalachian Mountains. 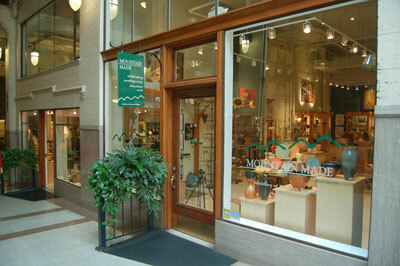 MOUNTAIN MADE is located inside the historically renovated Grove Arcade at 1 Page Avenue, Suite 123. Our store hours are Monday through Saturday, 10:00 am – 6:00 pm, and on Sunday from 12:00 pm – 5:00 pm. Why do we have an Easter Bunny anyway? MOUNTAIN MADE is a privately-owned art gallery that supports the entrepreneurial spirit of Western North Carolina area artists and craftspeople. Looking for Custom Made Artwork?